Taken from the nozomi superexpress. If you have a chance to get in the shinkansen(nozomi or hikari superexpress), you would have a chance to take like this. If you go to Nagoya, Kyoto, or Osaka from Tokyo, please watch the right side of window after the Shin-yokohama(after about 15minutes) you can find this beautiful mountain, like this. 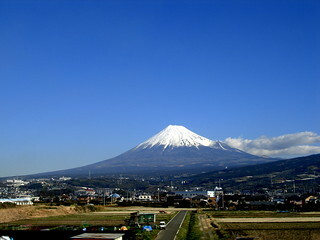 If you get in the "Kodama", you can find this beautiful moutain between Mishima and Shin-Fuji sta.